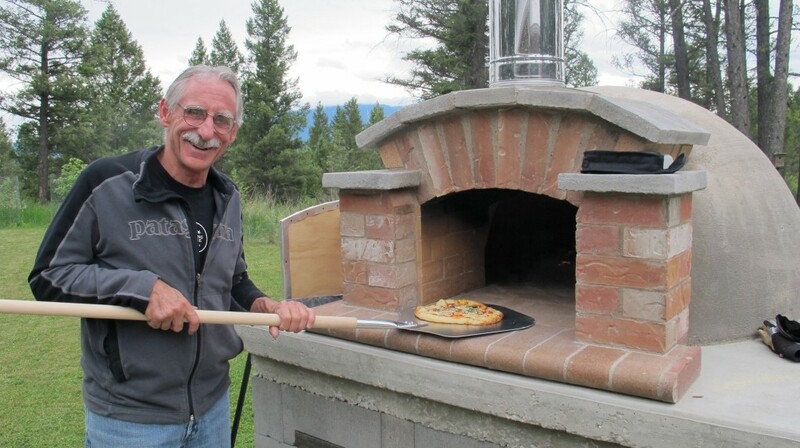 As you may know, not only is Doug the CEO of Dugla Tours, but he is also a fine builder of wood-fired pizza ovens- or horno de leñas in Espanol- and a muy buen cocinero of pizzas. In fact, I would say he has become a bit of a pizza aficionado, after me, por supuesto! If you are an expert on, or a drinker of, fine wines, you are called an oenophile. Does the same go for pizza, as in pizzaphile? If so, I suppose you could say that we have joined the ranks of pizzaphiles. 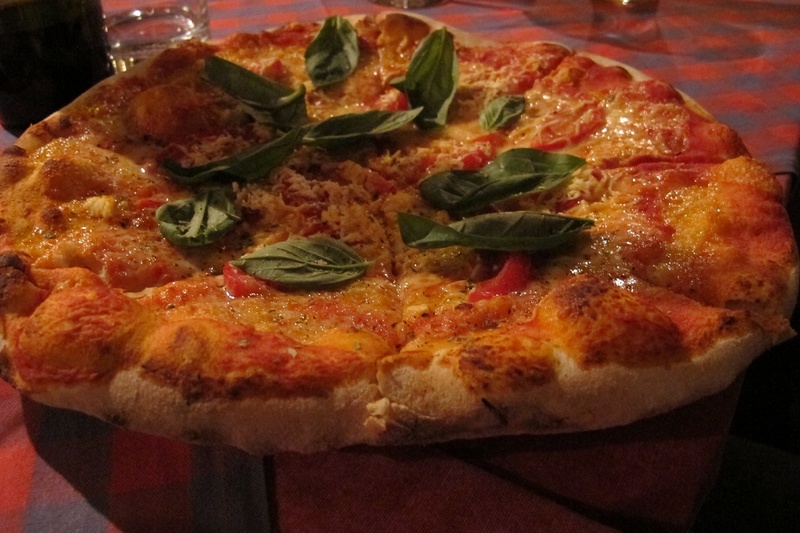 This little obsession we have acquired was borne out of a pizza-tacular experience we had at a little pizzeria in McLaren Vale, Australia, just south of Adelaide, a few years ago. 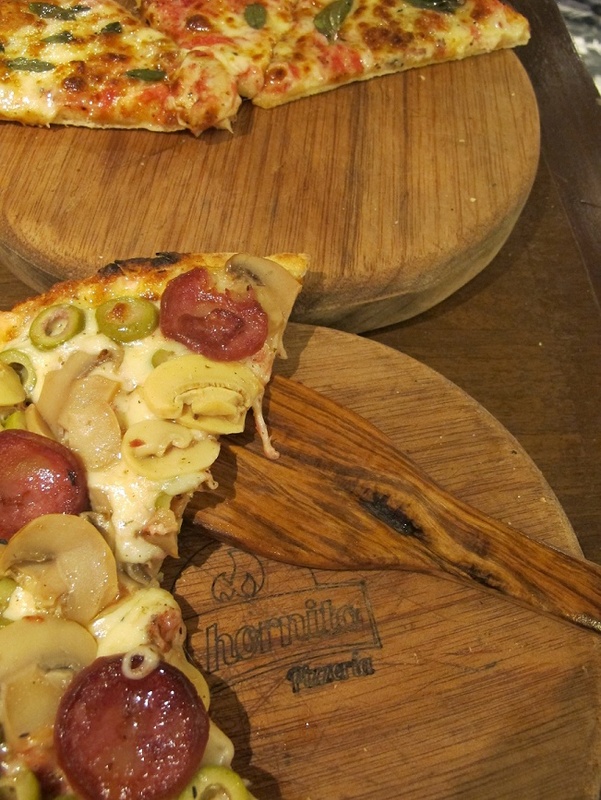 Russell’s Pizza is known far and wide for having the most incredible wood-fired oven pizzas anywhere in the Southern Hemisphere, all made with locally grown ingredients- local cheeses, olive oils, olives, fresh sausage and herbs- amazing. There were many times I wanted to jump on a plane back to Russell Jeavon’s little restaurant in an old Welsh miner’s cottage to have my fix. Really, I could go on and on. 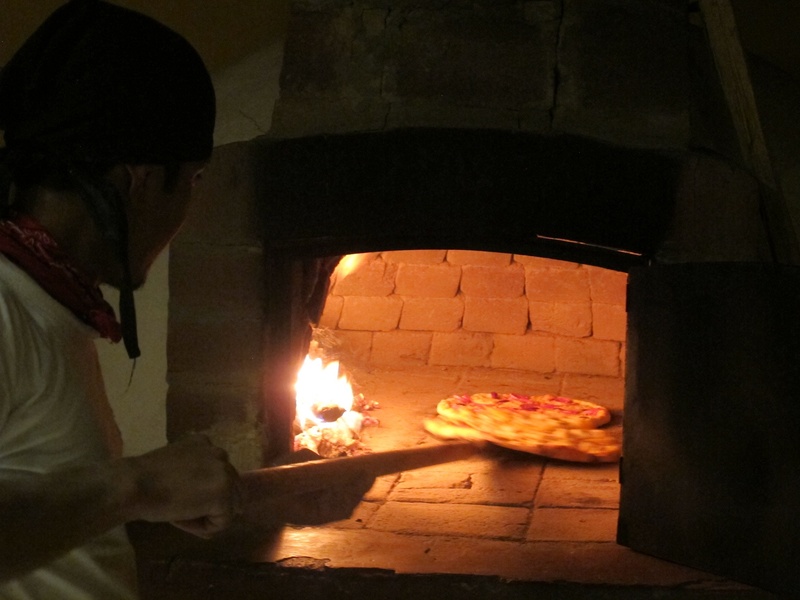 In fact, we loved it so much that ever since we dreamed of having our own pizza oven. 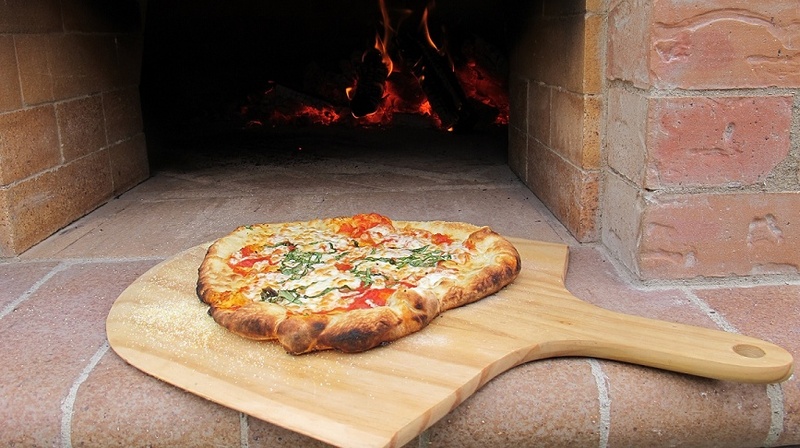 Well, lo and behold, last spring, Doug downloaded some plans from Forno Bravo- which is really worth checking out- and within a few weeks, ta da…an amazing horno de leña became the defining feature of our front yard. The Oven that Dugla Built! And so that night marked the first of many visits to Il Portico for terrific pizza made by maestro Marcello, a spirited Italian guy who is a passionate cook, loves to talk food and is a character with a capital “C.” The first night he shared his highly coveted artisan beer with us, joined us at our table with his wife and son, and generally treated us like his long-lost family. The next time, we kind of wondered if he even recognized us. You just never knew. No problem for us though, it all added to the experience! 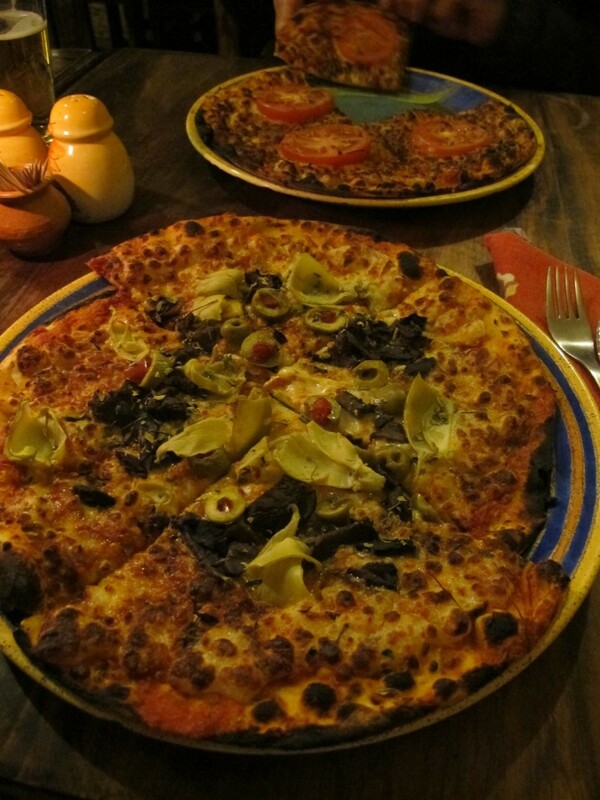 And, the most important thing…the pizza was terrific! 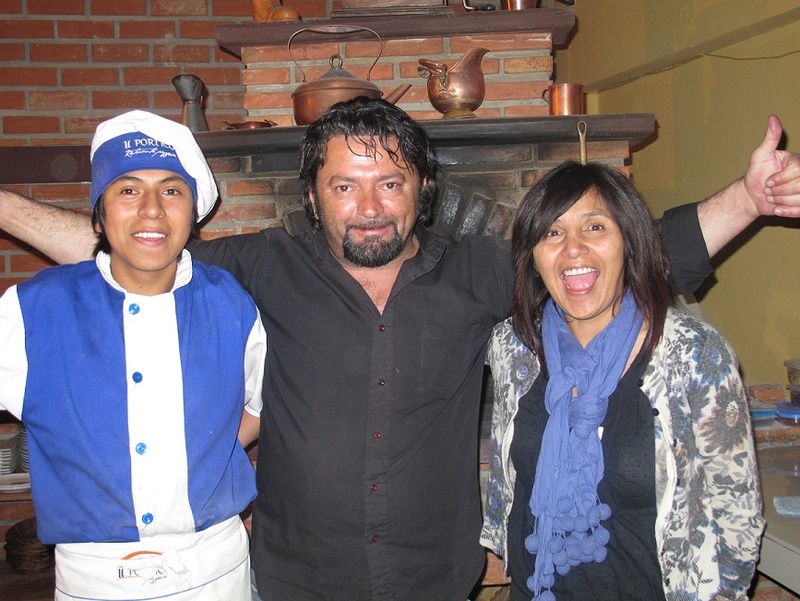 Seeing Marcello in action leading his team of great young Bolivian pizza chefs was also part of the charm. “Que?” “Que?” Marcello would ask in part Spanish, part Italian and a little English. We were never quite sure, but we always managed to communicate with each other and by the end of four weeks, we became the best of friends. Doug even got so comfortable with the place that he started doing a little pizza prep! 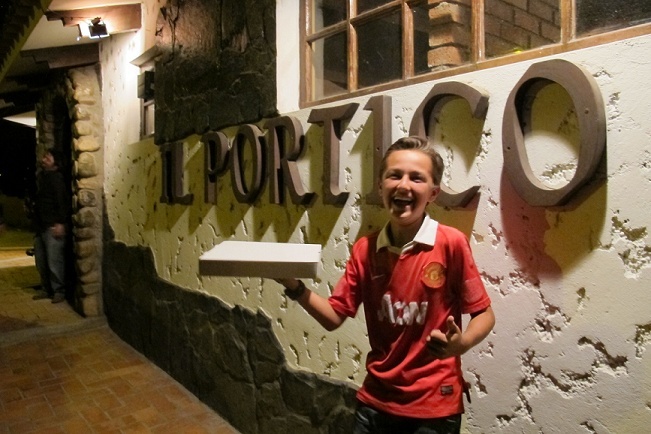 Dugla trying out for a job at Il Portico! 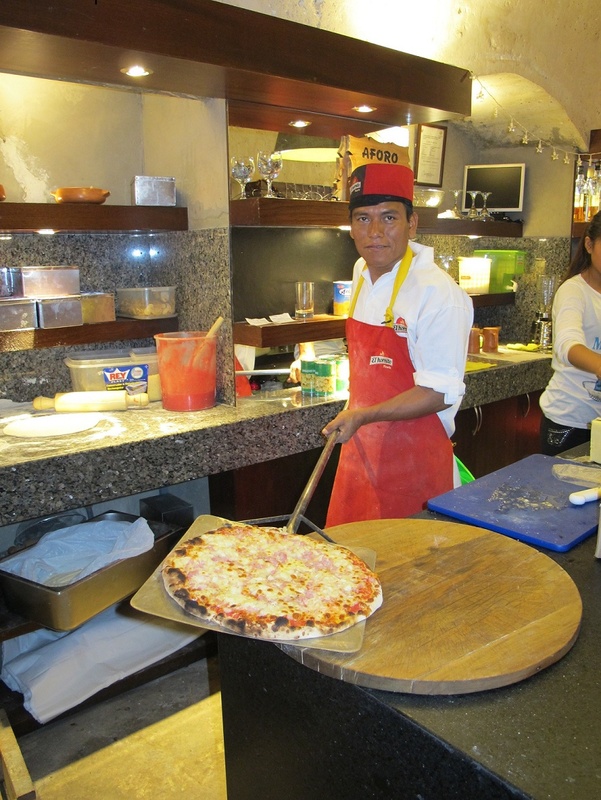 Every pizza was delicious, a super thin crust, fresh mozzarella…buenisimo! Leaving Jupapina and everyone at Up Close Bolivia was sad for us in many ways, but leaving behind Il Portico and Marcello made it even harder. 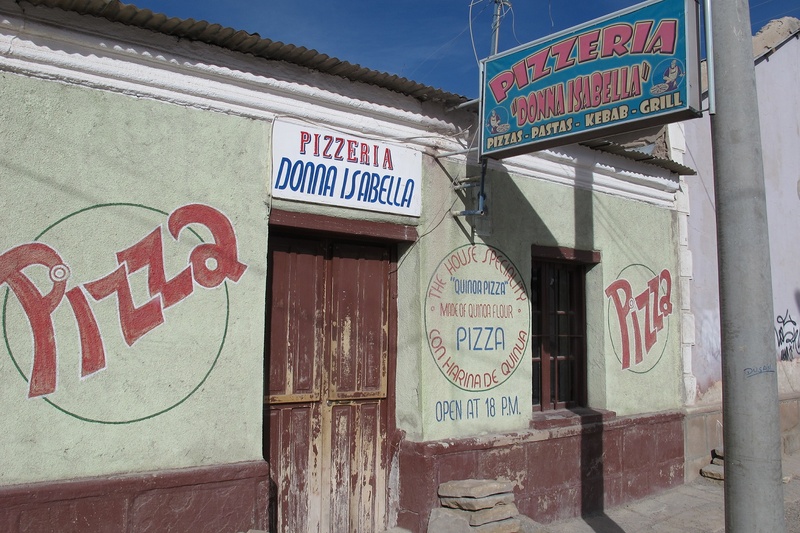 But, never fear, Dugla was on it and our next stop, Uyuni, provided another great pizza opportunity. After four days of touring the salt flats with nary a decent meal in sight, it was a huge thrill to find a great pizza joint right next to our hotel. Hello Quinoa Pizza with Spicy Alpaca at Pizzeria Donna Isabella. 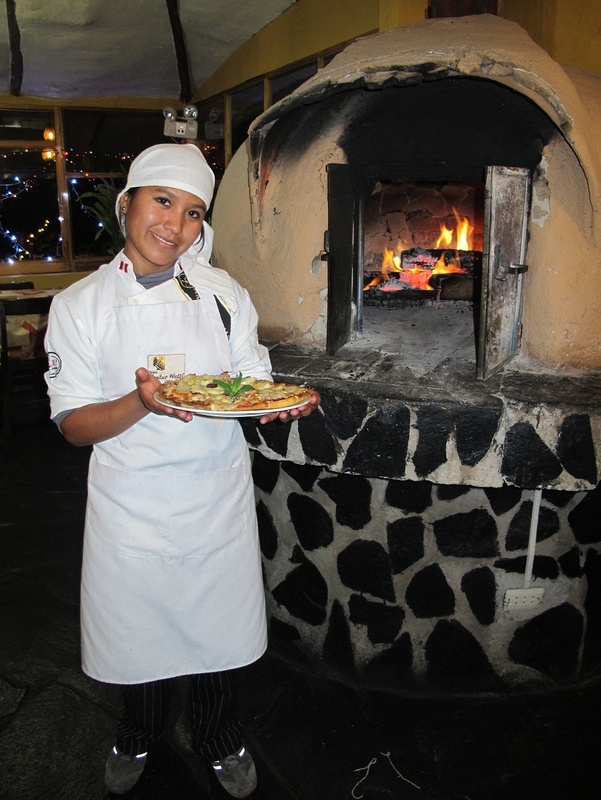 And, not just any quinoa pizza, but award-winning quinoa pizza made by Fernando, a chef who worked in Sweden for ten years! Mighty fine washed down with a quinoa beer, too! Prize-winning, quinoa-crusted, alpaca-topped, super yummy pizza! Gracias! Heading north to Peru, Dugla consulted his guide once again and found us another gem. 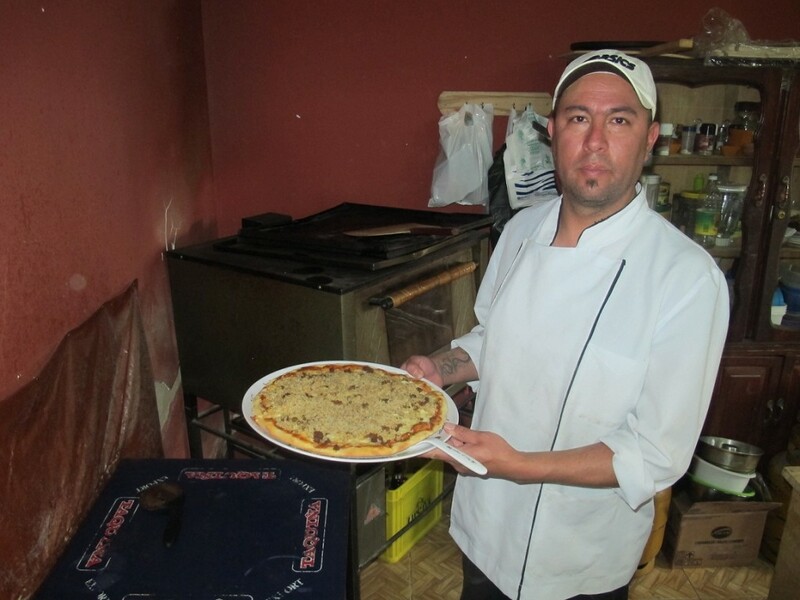 One of our best pizzas of the trip was at a great little restaurant in Arequipa. 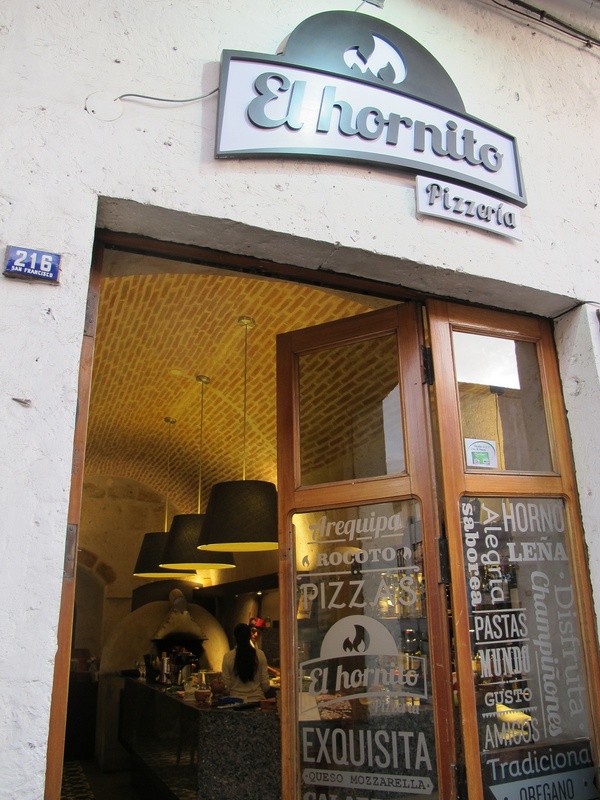 El Hornito is in the centre of this beautiful colonial city and this pizza definitely vied for a spot on our “Top Ten Pizza Experiences List.” The thing is, we never just go and EAT the pizza, we go into the kitchen and ask for a tour of the oven- Doug talks design and I talk recipes. If we have a computer with us, we even show pictures of our oven at home, which kind of places us in the pizza-stalker category, but everyone seems to love talking pizza! 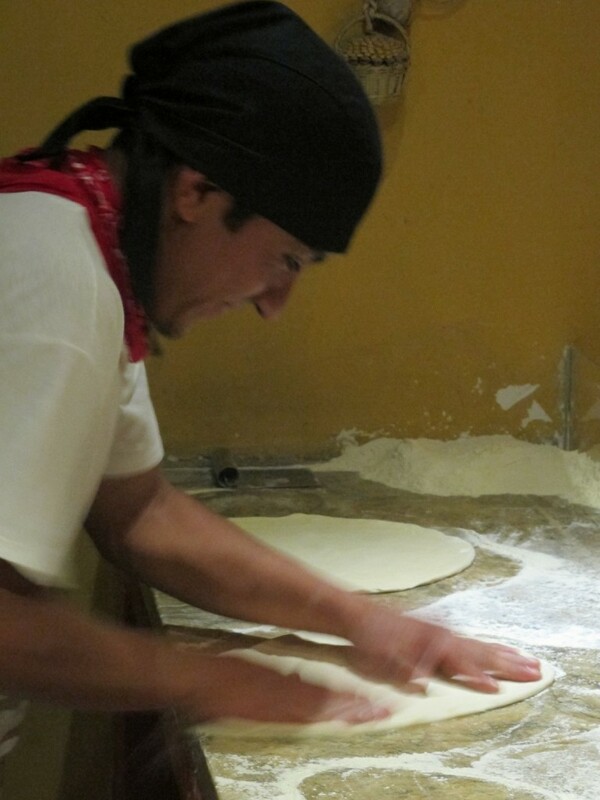 This night, our pizza was proudly made by Chef Hector. 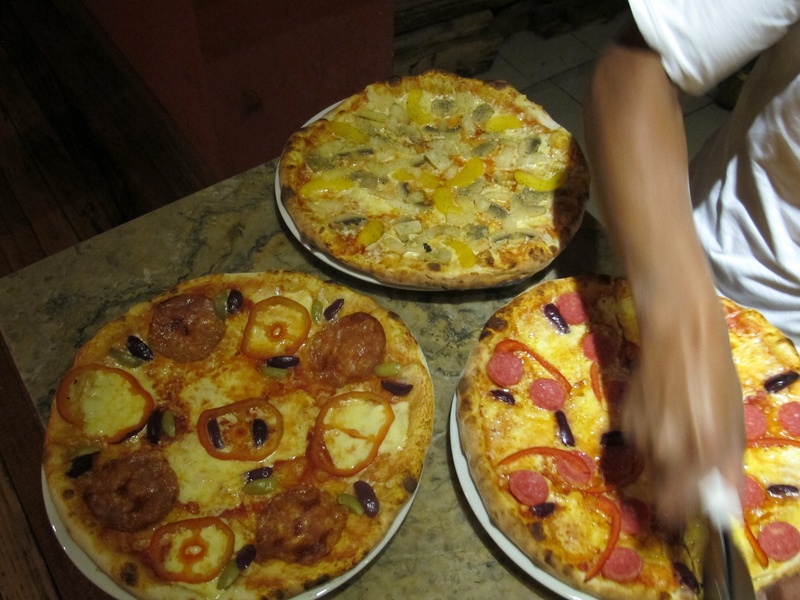 Of course we always order too much, so off we went into the night with six slices to share with our new friend and favourite breakfast cook, Alonzo, at our hotel, Hostal Solar. Next stop, Colca Canyon. As far as pizzas go, I wouldn’t say this was the most delicious pizza we have ever eaten, but it is definitely up there on the “Top Ten Pizza Experiences List.” Our evening at the Kunter Wassi Hotel in Cabanaconde was an absolute scream which started with a fabulous pisco sour- stay tuned for the Pisco Sour Chronicles coming soon- made by a young man who took his cocktail-making very seriously, followed by pizza baked by the most adorable trainee-chef in the world, and ended with us being dressed up in traditional Colca Canyon clothing by the hotel manager! I was in the loveliest of lovely embroidered “ropas” and Doug was wearing an awfully nice skirt, too! Apparently all the Incan warriors were wearing them! 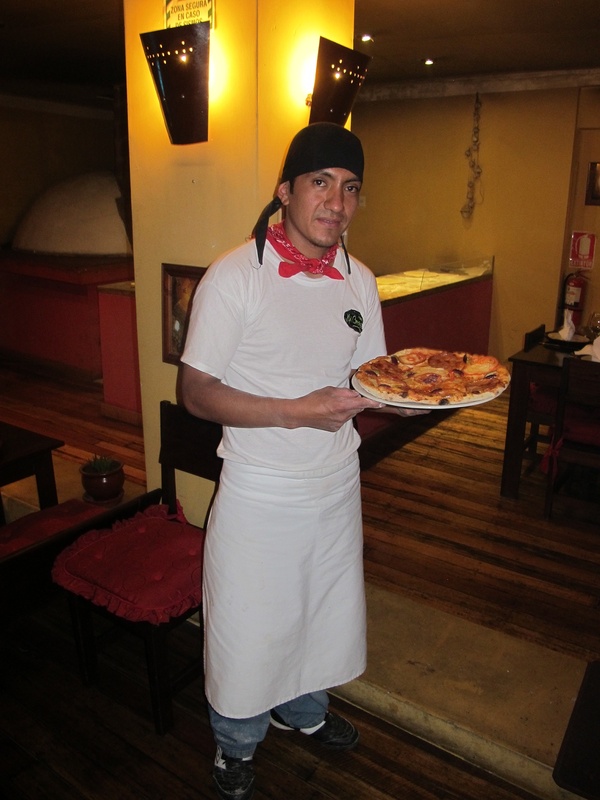 The most adorable pizza chef in Peru! Pizza and Cross-dressing! Now that’s a new one! 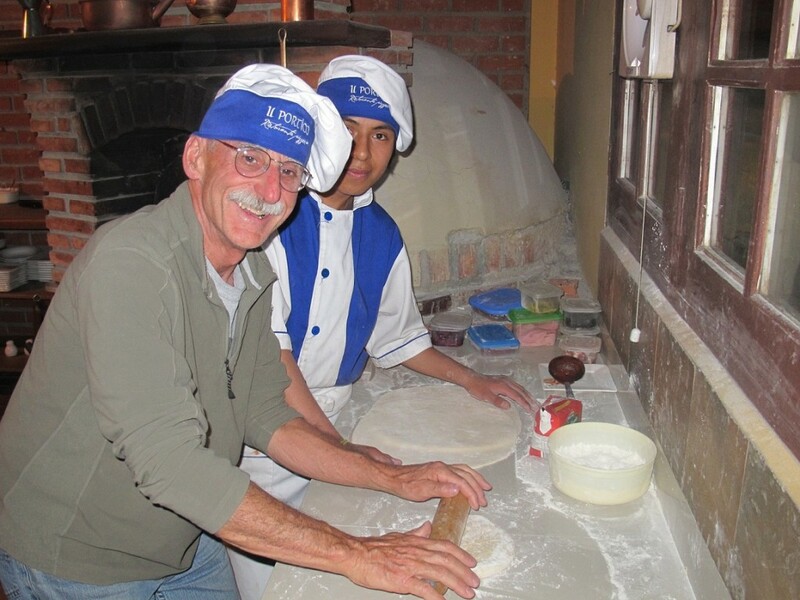 Moving north, didn’t we discover that in Hauraz, where we would be spending a month volunteering with the Andean Alliance, there was a little Italian restaurant with a horno de leña? Not only that, but the owner’s son just happened to be going to the Cordon Bleu Cooking School in Paris! And, the pizza was terrific. Very light crust with little perfect pockets of air, which is hard to achieve when you are at 3091 meters! 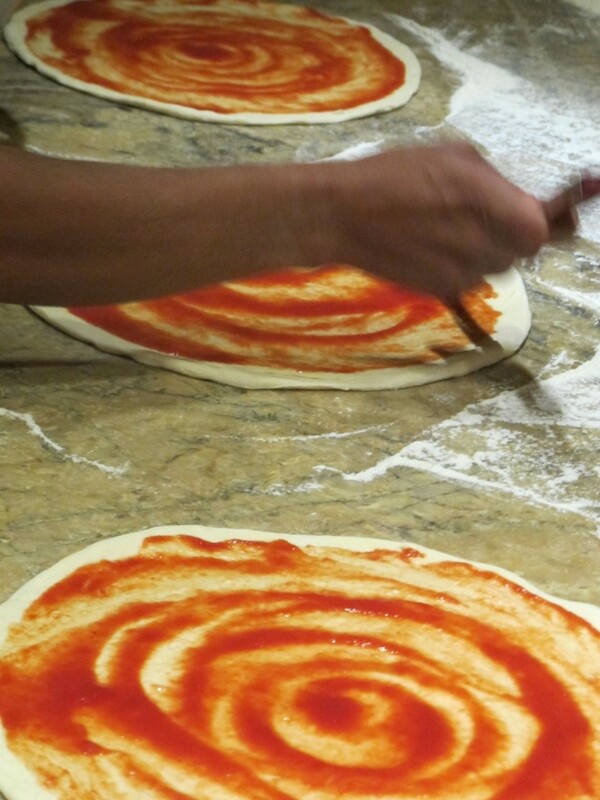 Spicy local chorizo, queso fresco, a pizza chef who whirled the dough in the air. 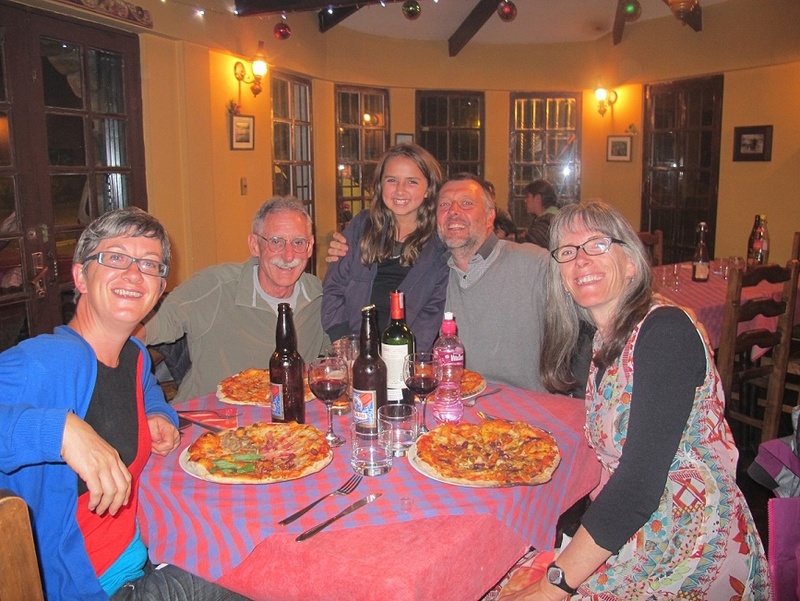 Ah, yet another great pizza experience at Mi Comedia in Huaraz, Peru! Saucing after whirling. That part was too quick for me to catch on camera!! 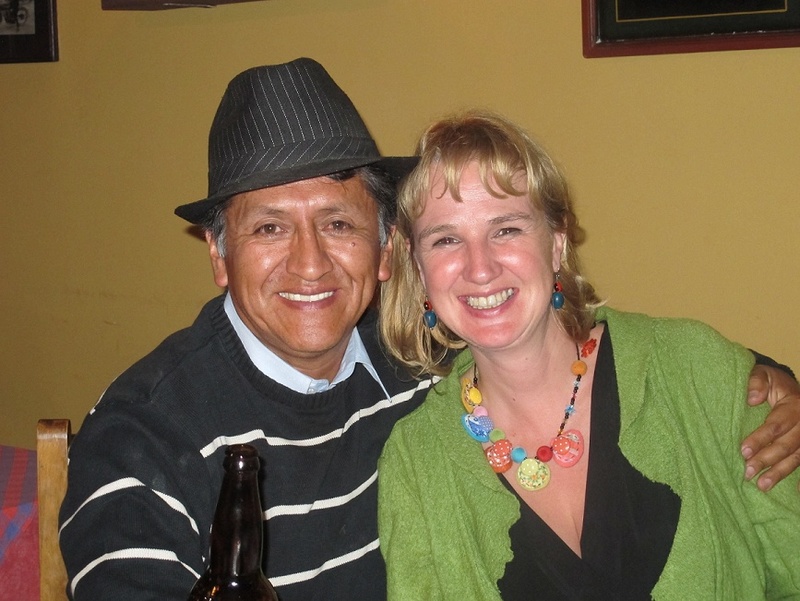 And, on to Ecuador for the last days of our trip. 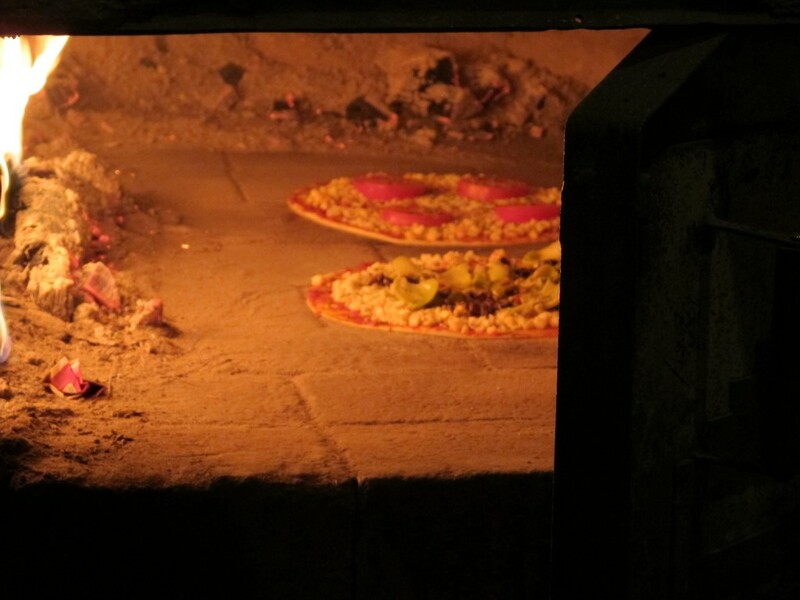 Otavalo is known for the best artisan market in South America, but is there any good wood-fired oven pizza? I mean, I love the prospect of a good market, but we have priorities! When I consulted with the CEO of Dugla Tours, it turned out that there was only one place in town worth checking out, so off we went last night. In the back of the Hostal Doña Esther you’ll find Arbol de Montalvo a cozy little café warmed by a beautifully-made horno de leña. 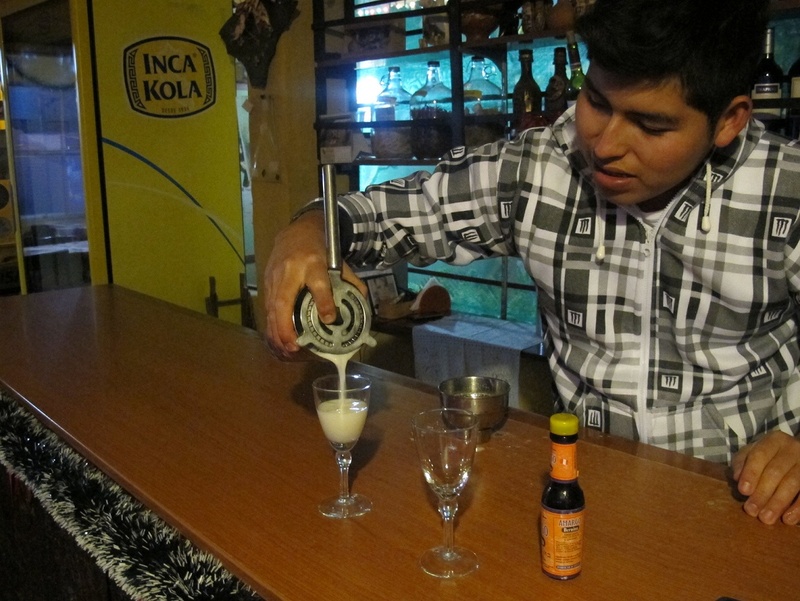 The minute we sat down, we were offered a bowl of popcorn and two teeny glasses of warm cane sugar and cinnamon liqueur by a lovely women in traditional Ecuadorian clothing. 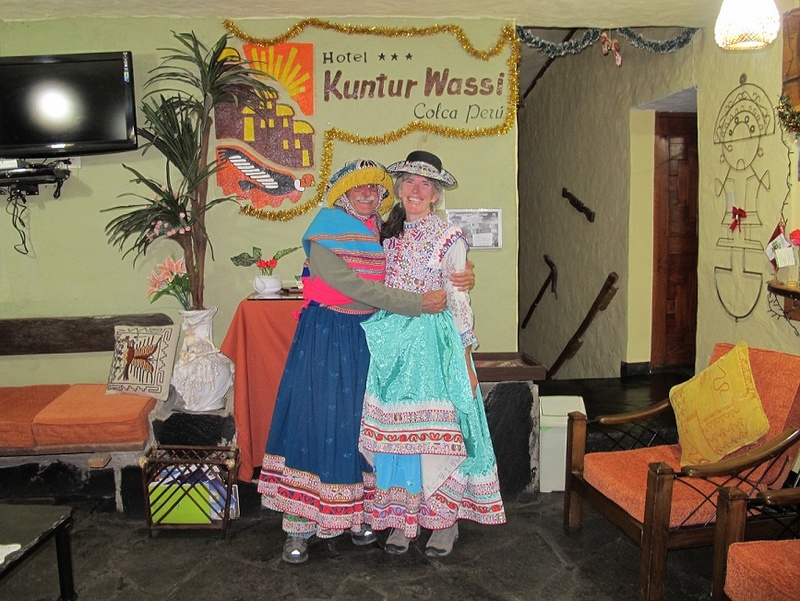 The women in Otavalo wear beautiful long sari-like skirts, colourful embroidered blouses and gold-beaded necklaces. I make a mental note to check out the buying possibilities at the market tomorrow, but first to the pizza. 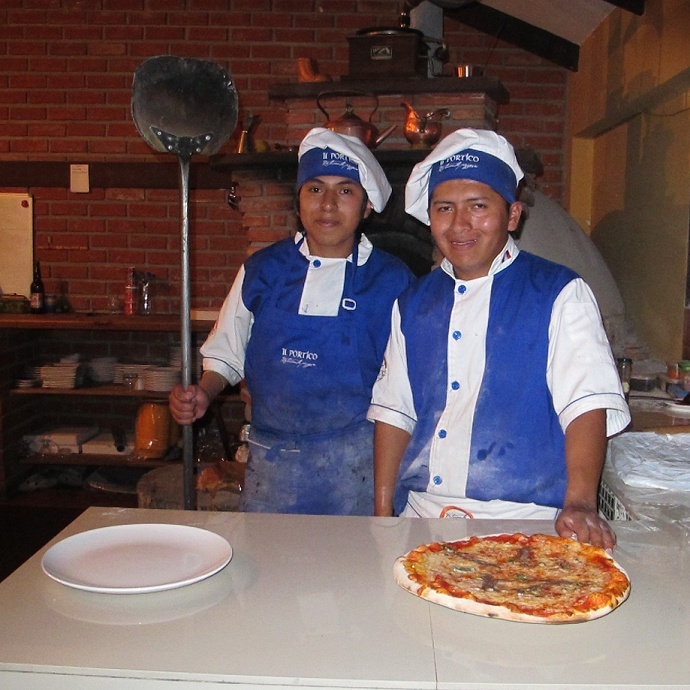 Our Otavalo pizzas cooking in a flash! Doug ordered his usual, Marguerita, while I branched out and had a Capricciosa with acitunas negra y verde– black and green olives- and artichokes. Cooked in about ten seconds in the blazing oven, it was good and definitely hit the spot, but we confessed that we were both dreaming about getting home, firing up our little oven and falling into pizza heaven, Canadian-style! Not sure if we’ll find another horno de leña between now and when we touch down in Calgary, but we’ll keep you posted! Looking forward to a Marguerita Pizza a la Dugla! My mouth is watering! Great blog!